Provides an almost-complete overhaul of the PC version. After four years of development, the fan-made HD update to Resident Evil 4 is now available to download. Although Capcom released its own HD Remaster in 2014, it wasn’t the complete overhaul fans had hoped for. Specifically, many of the game’s textures were left in their vanilla state. The HD Project mod aims to be the overhaul that Capcom’s version wasn’t, and its creators have gone to remarkable lengths to make it happen. 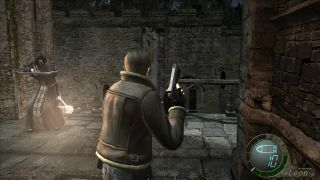 The project lead, Albert, actually visited the locations where Capcom originally sourced the game’s textures (primarily Spain and Wales) to gather new images which the mod's higher-resolution materials are based upon. The HD Project replaces virtually all the textures in the game’s three key areas, namely the village, the castle, and the island. It makes smaller changes too, such as adding real-time lighting effects to torches and flaming arrows, while switching out the low-poly Ganado models in the game’s cutscenes for high-res versions. A full list of the updates can be read here. There’s a slight irony to the release, however, which is that it isn’t quite complete either. The creators admit there are still a few areas left to brush up. Specifically, enemies and playable characters have not been updated, while the devs still want to add “weapon and item refinements”, whatever that means. You can download the update here. Below is the launch trailer from last month, which shows off comparisons between the original game and this new remaster. It’s a striking upgrade, and includes the most impressive wine-rack reveal I’ve ever seen.